SnoPlanks began in James Nicol’s garage. He and college friend Ryan Holmes wanted to create a different type of snowboard. “We were looking for something that was more surf style and that really lent itself to Mt. Bachelor, which isn’t super steep,” Nicol said. In search of something light, flexible and beautiful, they began making boards from bamboo. What started as a passion project has exploded into one of Bend’s most talked about new companies. SnoPlanks won the $15,000 early stage award at the Bend Venture Conference in October. Now the founders want to show the rest of the world what bamboo boards and skis can do. Both Holmes and Nicol grew up in the Pacific Northwest and spent their childhood vacations in Central Oregon. They reconvened in Bend within the past few years and started contemplating the potential for a new type of board while riding at Mt. Bachelor. They touted the simplicity of their product. No crazy colors. No wild designs. Just the beauty of the wood combined with a unique ride, especially made for powder. It wasn’t long before their ski and boards grabbed people’s attention. Other riders wanted to know what these wooden boards were all about. Their first big order came last fall—160 snowboards for Deschutes Brewery, which is using them as part of its Red Chair promotions. 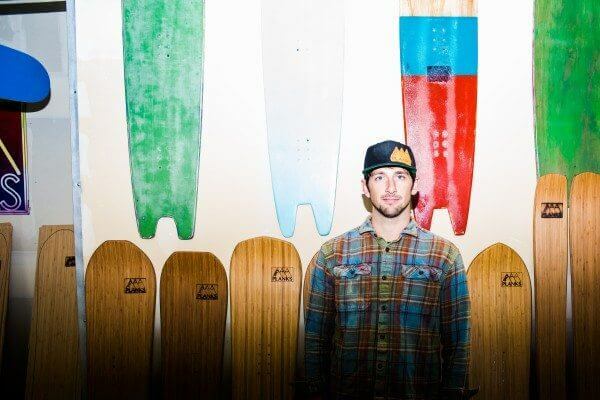 Holmes and Nicol, along with their employee, made all of the boards by hand. They believe this season could be a game changer for SnoPlanks, as they invest in production efficiency marketing. They’d already sold 200 boards by the end of October. SnoPlanks are available on the company’s website and will also be in some local Bend shops.